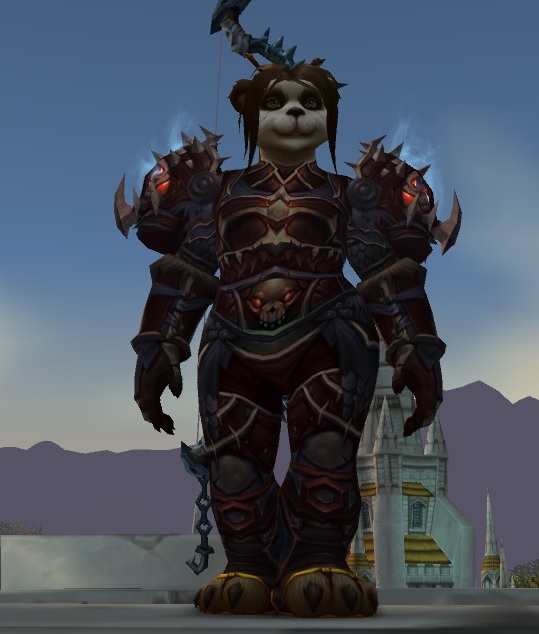 I would love to find a nice pair of boots and a belt for this set. Botas do Espreita-gronns seem to be a good match for this set. Belts are a little harder to shop for, but I'd personally go with something like Cinto Articulado do Depravado or Cinturão de Filósseo. 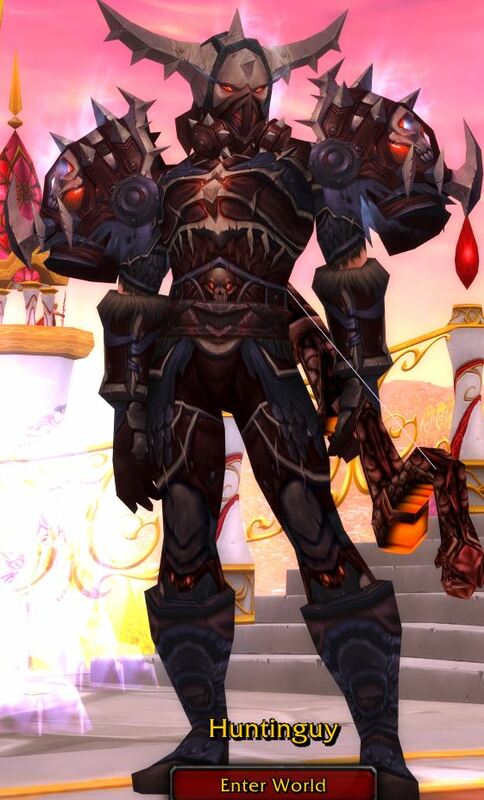 I will be using http://www.wowhead.com/item=56494#. as boots for this set.they kinda match and since they only cover the feet of your character, it blends into your legs nicely. Currently using Nightshock Girdle and Star's Rest Treads for this set, colors match relatively well. Using Bondsniper as a matching gun. I'm surprised nobody else knew about the matching boots for this set. Here you go. If anyone is still trying to find a great matching pair of boots for this recolor, I recently found that matches almost perfectly. Abraço de Dory is a nice cloak to go with this set. This is Caçador 10 player Tier-8 from Ulduar. There are also three other colors. Actually found that I had in my bank a Perfect match for the foot with color and really heaviness plate-like skin. Grevas do Ataterra are a perfect match for boots. Probably overlooked as they have shaman specs. I currently have them mogged and look great in game. They even drop in 10man Ulduar with the rest of the gear. Here's the set with matching boots, a belt and bow. Esporos de Courescama go REALLY well with this set. I only wish the yellow lining was more beige, and i wish the boots were a lil bit thicker. Found some good matches for the belt and boots and easy to get so long as you haven't quested too much in Sholazar Basin. Tier 8 is a 5-piece set obtained in Ulduar, requiring level 80. There are two skins for every set: the ilvl 219 set from 10-player Ulduar, and the ilvl 226 set from 25-player Ulduar. This page is for the 10-player version. Other than the aforementioned Cinturão do Choque Noturno, Cinto do Tocaieiro and Cinturão da Tempestade seem to match pretty good. For boots, I think I'm going to go with Grevas do Desespero Paralisante. The bloodied, bandaged look seems to go well with this set. For cloak, Manto de Erva-moura or Grande Manto Quebra-perna/Manto Enevoada do Vento Gris. Arco Amaldiçoado da Elite matches near perfect. I have my set together, I have just posted a screen shot, now I'll give you the breakdown of what I came up with. Of course, the 5 pieces of Scourgestalker Battlegear are all used (head, shoulders, chest, hands, legs). Now for the other items. I would like to try the previously commented Botas do Voo Renovado, however I haven't been able to get them to drop quite yet. Now you can grind drops on those 4 and hope they drop (low drop rate), or you might just get lucky and find some on the auction house. I have a LOT of bows/guns so I was able to go through quite a few. Themios, o Arauto da Escuridão a very good choice, perhaps the best choice, I am currently using it. The overall colors of the bow match well, the fire is a little off but it gives the bow a wicked look to it. Vishanka, a Mandíbula da Terra The bow from the final Dragon Soul raid encounter, in this case normal mode. The red isn't quite right but the overall build of the bow matches well. Arco dourado de Quel'Thalas Absolutely gorgeous bow, however the coloring gives it a shiny appearance versus the darker color of the armor. Even so though, it is a very good choice. Arathar, o Olho da Chama The red isn't quite right, however it works in a pinch. Canhão-de-mão Kor'kron Although the page says it is no longer available, there are several of the same model red version of this gun. Currently using Manto de Erva-moura, same as Capa Neroflama, Manto Noturno, and Manto Inigualável. These are BOE, so you can hopefully find them on the AH like I did, because they have a low drop rate. Of course there are other choices, a lot of the Orgimmar color cloaks work well, as does Manto do Poder Subjugado. There are honestly a lot of reasonable cloaks with this group, I just picked the one I did because the dark red around the black really looked the best to me. Tabardo dos Mag'har My tabard of choice, although, again, a lot of the Orgrimmar colored ones work. I am currently using the best from one of the other Ulduar sets, the Cinto do Fosso de Sangue. Because it was designed for an alternate color but the same set type, it matches fairly well. This was the final set I put together, I have all 4 sets now (blue/green/black/red) and honestly I think this is the best hunter mog set that blizz ever created, I love all 4 sets. Great belt match and found on the AH. This is for the 25 man version just to clear things up. I've been farming this set for a while and couldn't understand why I never got the tier tokens to drop. Perhaps this is obvious and I'm just oblivious but since this is the only raid that converts bosses to 'heroic' mode through mechanics then I'm going to cut myself some slack. You need to do these on normal mode to get the tokens to drop. At high levels it is hard to not just plow thru and kill the bosses outright but that usually converts them to heroic and you won't get the token. Helm: Mimiron (10) - Don't push the giant red button. This one is the one I got all the time because I never pushed the button. Shoulders: Thorim (10) - Wait three minutes before attacking Thorim. It used to be a race to get to him under that time but to keep it in normal you'll just need some patience. Chest: Yogg-Saron (10) - Activate all the keepers before leaving the antechamber. Not sure if activating one matters versus all of them since there's different achievements for how many keepers are up. Gloves: Freya (10) - Kill the three tree ancients before attacking Freya. Legs: Hodir (10) - Get all the npcs out of their ice blocks before killing Hodir. Hope this helps some hunters out there who felt like they were just ridiculously unlucky.